Senator Bernie Sanders opines U.S. not playing even role in Israel-PA conflict, says he would reduce Israel aid under certain circumstances. 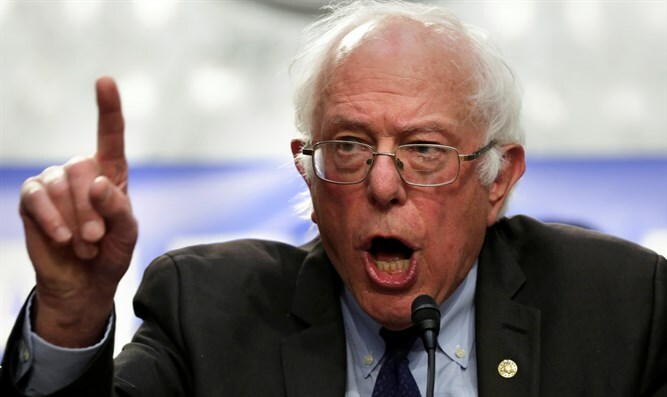 Senator Bernie Sanders (I-VT), who challenged Hillary Clinton for the Democratic party nomination in the 2016 presidential election, said that under certain circumstances, he would consider reducing the yearly $3.1 billion in military aid provided by the U.S. to Israel. His comments were made in interview on foreign policy issues to the website The Intercept, which was published on Friday. "In terms of Israeli-Palestinian relations, the United States has got to play a much more evenhanded role. Clearly that is not the case right now,” he told The Intercept. Asked if he would "ever consider" a reduction of military aid to Israel, Sanders replied, "The answer is yes". "U.S. funding plays a very important role, and I would love to see people in the Middle East sit down with the United States government and figure out how U.S. aid can bring people together, not just result in an arms war in that area,” he continued. “I think there is extraordinary potential for the United States to help the Palestinian people rebuild Gaza and other areas. At the same time, demand that Israel, in their own interests in a way, work with other countries on environmental issues. So the answer is yes,” added Sanders. Sanders ran for the Democratic presidential nomination but lost to Clinton before endorsing her and campaigning extensively for her. He has not ruled out another presidential bid in 2020. Despite being Jewish and having spent time in a kibbutz when he was young, Sanders has a history of problematic statements on Israel. He previously argued that one could sharply criticize the Israeli government’s policies and still be pro-Israel. “Like our own country, the founding of Israel involved the displacement of hundreds of thousands of people already living there, the Palestinian people. Over 700,000 people were made refugees. To acknowledge this painful historical fact does not ‘delegitimize’ Israel, any more than acknowledging the Trail of Tears delegitimizes the United States of America,” Sanders claimed.